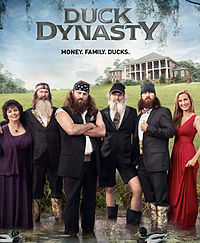 I have just been getting into the show Duck Dynasty and finding it quite entertaining. This is a reality program that is unscripted and shown on A&E network. It portrays the Robertson family's daily lives as a red neck success story that made their wealth building the Duck Commander duck calls as well as other hunting products. They are located in West Monroe, Louisiana. I suppose the one thing that has really grabbed my attention was the willingness to show a good Christian lifestyle and not showing any reservation to the Christian faith. They do not preach or use bad language but entertains. They show the Christian live as something fun and not restricting. At the end of every show, they are shown praying for their food and providing some good words of wisdom. I was impressed with one of the last episodes where the Robertson family required some professional assistance on something and when the company showed up, the trailer they were pulling boldly portrayed Eph 2:10.